The heme-based sensors are a growing family of proteins which sense signals from the environment (in prokaryotes) or from neighboring cells (in eukaryotes) by the use of a heme co-factor. 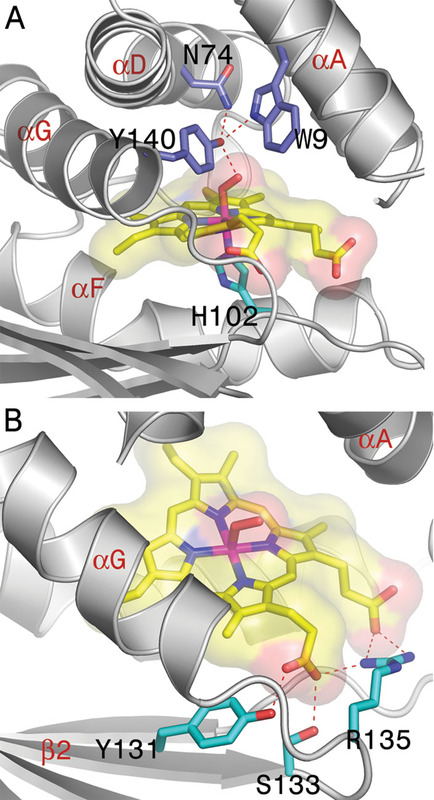 This group of proteins generally comprises two distinct domains: a heme-containing sensor domain which senses a gaseous ligand, and an effector domain which generates an output signal. While all the heme-based sensors utilize the same heme co-factor, different protein scaffolds have evolved to afford the heme group a variety chemical environments resulting in their unique ligand specificities. In mammals, the only proven heme-based sensor is the soluble guanylate cyclase, an enzyme that responds to the intercellular messenger nitric oxide by producing cGMP. There are no known structures of soluble guanylate cyclases. The recent explosion of microbial genome sequences, however, has allowed us and others to identify a family of heme sensors containing domains which are related in sequence to the heme domain of soluble guanylate cyclases. Soluble guanylate cyclases are nitric oxide-responsive signaling proteins in which the nitric oxide sensor is a heme binding domain of unknown structure that we have termed the H-NOX (for Heme-Nitric oxide and OXygen binding) domain. H-NOX domains are also found in bacteria, either as isolated domains or fused through a membrane-spanning region to methyl-accepting chemotaxis proteins. 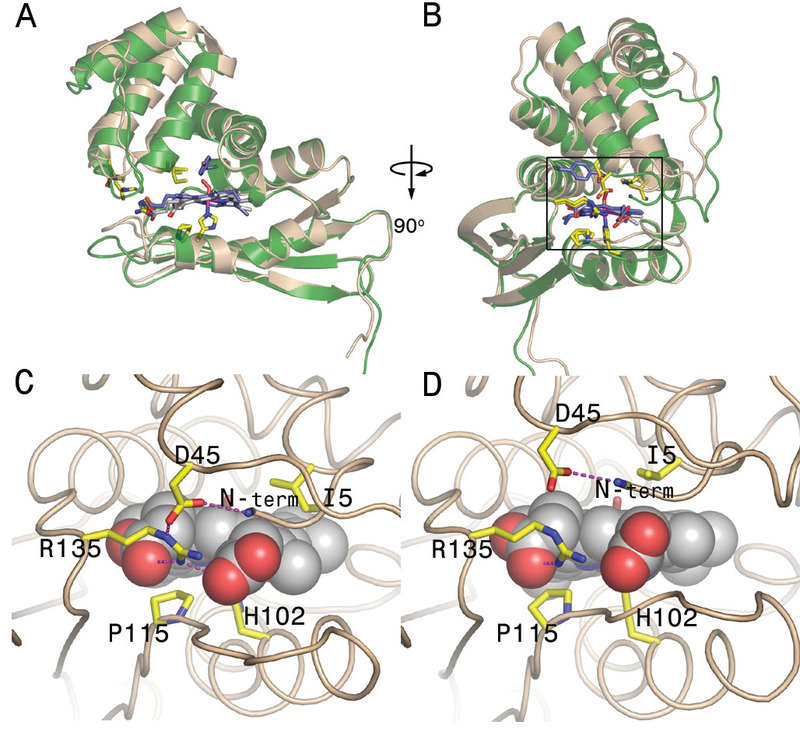 We have determined the crystal structure of an oxygen-binding H-NOX domain of one such signaling protein from the obligate anaerobe Thermoanaerobacter tengcongensis at 1.77 Å resolution, revealing a novel protein fold. Particularly striking is the structure of the protoporphyrin IX group, which is distorted from planarity to an extent not seen before in protein-bound heme groups. 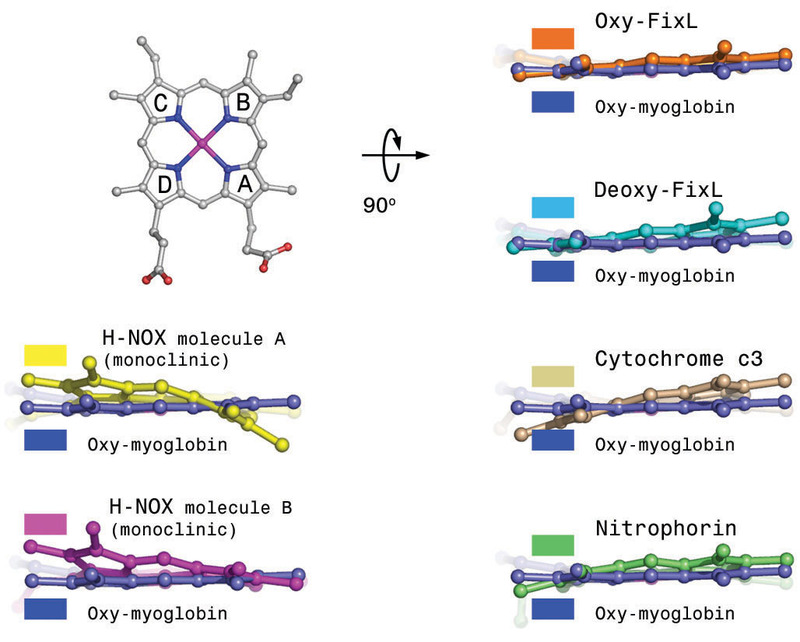 Comparison of the structure of the H-NOX domain in two different crystal forms suggests a mechanism whereby alteration in the degree of distortion of the heme group is coupled to changes on the molecular surface of the H-NOX domain and potentially to changes in intermolecular interactions. 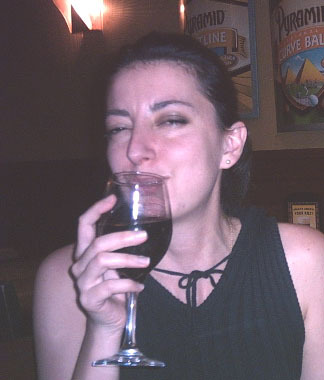 Click on the small image to get a bigger one. Figure 1. 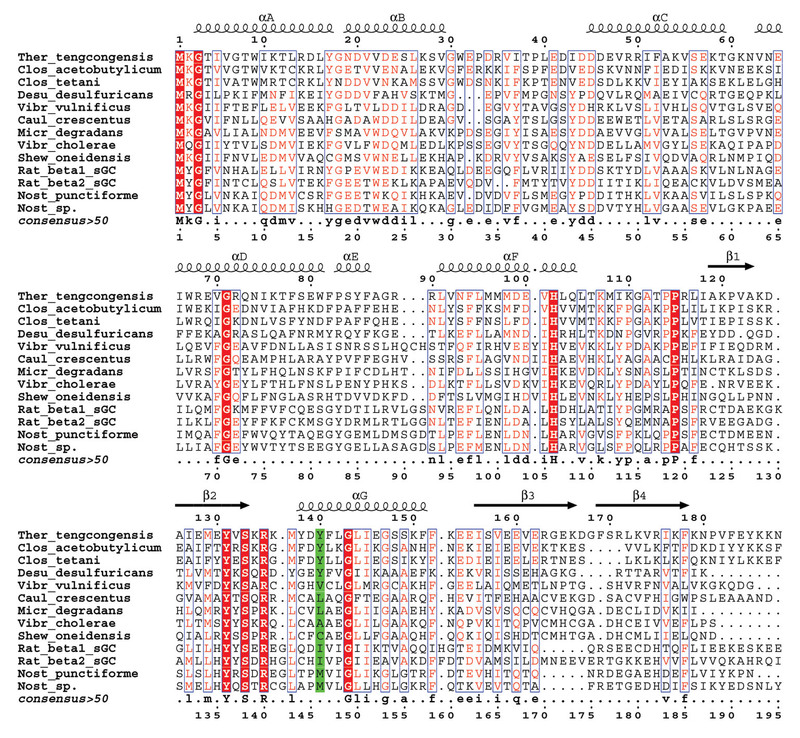 Multiple sequence alignment of selected H-NOX domains. 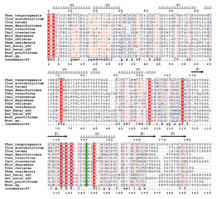 Secondary structure annotation, and numbering on top, correspond to the H-NOX domain from T. tengcongensis. Alpha helices are represented by spirals and beta strands by arrows. The position of Tyr 140 is indicated by a green box. Accession numbers are as follows: Ther_tengcongensis_gi|20807169|, Clos_acetobutylicum_gi|15896488|, Desu_desulfuricans_gi|23475919|, Rat_beta1_sGC_gi|27127318|, Rat_beta2_sGC_gi|21956635|, Nost_punctiforme_gi|23129606|, Nost_sp._gi|17229770|, Vibr_vulnificus_gi|27361734|, Caul_crescentus_gi|16127222|, Micr_degradans_gi|23027521|, Vibr_cholerae_gi|15601476|, Shew_oneidensis_gi|24373702|. Alignments were carried out using Multalin (42). Figure was prepared using ESPript (43). Figure 2. Structural features of the H-NOX domain. Stereo side view of the H-NOX domain. 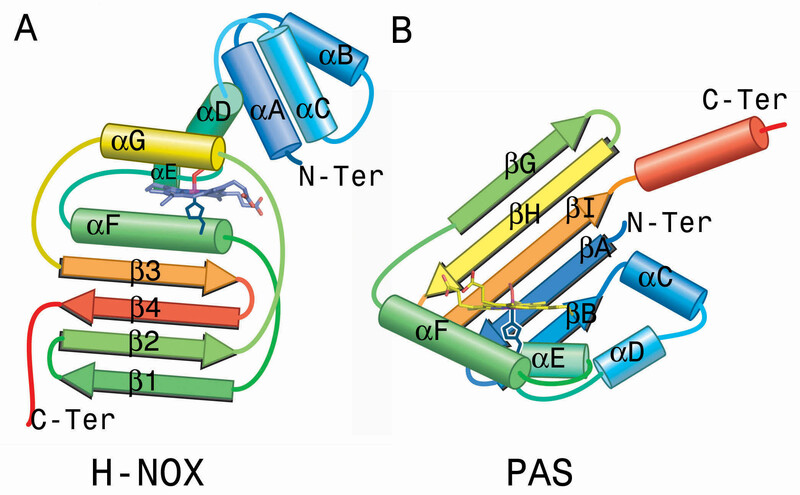 Protein fold represented by ribbon diagrams. 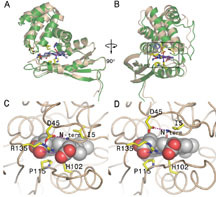 The heme, dioxygen ligand, and proximal histidine are shown as ball-and stick models. Helices are labeled A-G according to the nomenclature shown in figure 1. Beta strands are labeled 1-4. Figure 3. Heme environment. (A) Ligand binding pocket. Tyr 140 is seen hydrogen bonding (red dashes) to the heme-bound oxygen ligand. 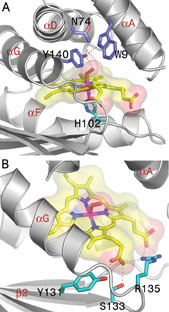 Trp 9 and Asn 74 interact with Tyr 140. The proximal ligand, His 102 is also shown. (B) YxSxR motif, corresponding to residues Tyr 131, Ser 133, and Arg 135, coordinates heme propionates. Figure 4. Heme distortion. Schematic diagram of the heme group with pyrrole groups A-D labeled. 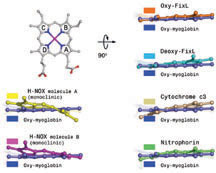 Pyrrole groups B and C were used to superimpose the heme groups from different proteins with that of oxy-myoglobin. Heme propionates have been removed for clarity. Figure 5. 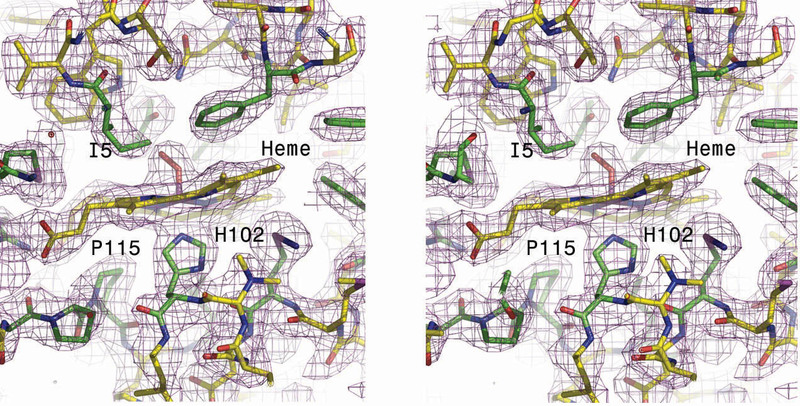 Structural changes associated with different heme conformations. (A) Ribbon diagram showing the superimposition of two molecules exhibiting different heme conformations. Molecule A (monoclinic) is shown in green and molecule B (monoclinic) in white. (B) 90o rotation of panel (A) about the y axis. The section blown up in panels (C) and (D) is boxed. (C and D) Diagram showing the major changes in networking interactions. Molecule A (monoclinic) with the more distorted heme is shown in panel (C). Molecule B (monoclinic), which has the less distorted heme, is shown in panel (D). Figure 6. Topology diagram. Topology diagram comparing the (A) H-NOX domain to the (B) PAS domain of BjFixL (3). Alpha helices are represented as cylinders and beta strands as arrows. The relative positions of the heme and the proximal histidine are shown for reference. Figure 7. Heme electron density map. Stereo view of the electron density map calculated using experimental amplitudes and phases at 2.4 Å resolution, contoured at a level of 1σ. Shown is the heme group from molecule A in the orthorhombic crystal form. Residues making close contacts with the porphyrin ring are colored green.